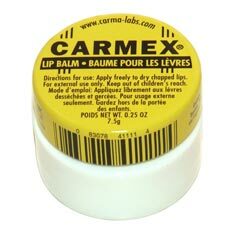 Carmex is frequently used by people who have discomfort in their lips. Carmex will heal chapped lips and is also used to treat cold sores, but can Carmex be a cure for angular cheilitis Learn how to cure angular cheilitis.? Usually when someone first gets angular cheilitis they think that their lips are overly chapped, so they will begin applying copious amounts of chapstick like Carmex to their lips for relief. Unfortunately, angular cheilitis is not caused by dry lips or cold sores, so all chapstick and Carmex will do is to provide temporary relief. In fact, sometimes chapstick and Carmex can help spread the angular cheilitis from one corner of your mouth to the other. Since angular cheilitis is fungal/bacterial based, when you apply the Carmex evenly across your lips you may unknowingly be smearing the bacteria/fungus across your entire mouth. If you only have angular cheilitis on one side of your mouth, it can easily be spread to the other corner of your mouth by doing this. Angular Cheilitis Diet Can changing your diet immediately help to cure you of angular cheilitis? Find out.